I myself feel so tough to eat Oats. Then how can I ask my hubby or kid to eat it? I know Oats have various health benefits. That is why, oats has become suddenly popular in every household. Everyone wants to start their day with oats mainly since it reduces cholesterol and helps to lose weight. But, its taste is what keeping me to ignore it. I make Oats upma, Lemon oats and all. I eat them for the sake of health. But my hubby and my little one do not even touch it. I was seriously looking out for a tasty oats recipe to make them to eat. This is how I came up with Chocolate Oats recipe. 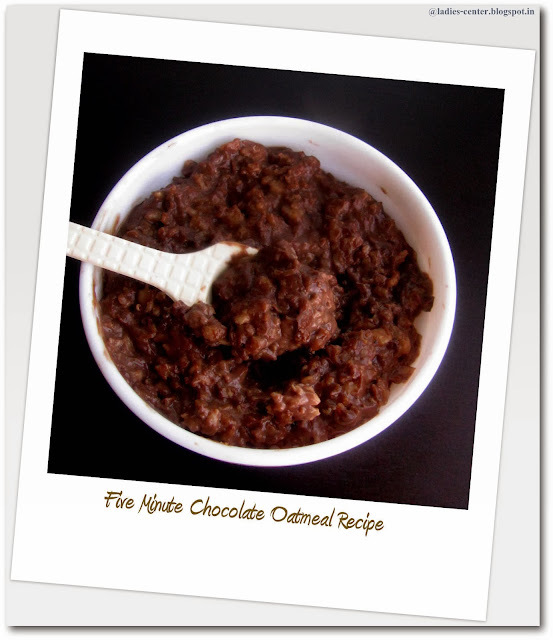 Chocolate Oats recipe is a simple, tasty and healthy recipe. So, what are you waiting for? Try this easy sweet and chocolate oatmeal recipe tomorrow for your breakfast. It takes just 5 minutes and tastes chocolaty. You might also like our tasty masala oats recipe. 1. Boil oats and milk with 1/8 tsp of salt in a pan. Cook it for 3 to 4 minutes according to the instructions from the brand. 2. Once the oats is cooked, add Vanilla essence, cocoa powder and honey to the oats. Mix it well and cook it till the raw taste of cocoa powder goes off. If you are adding chocolate syrup, just mix well and switch off. Also check more quick snack recipes. 1. You can add any kind of sweetener like dates syrup, sugar etc instead of honey. I dont prefer adding jaggery since it alters the taste totally. 2. Adjust sweetness according to your taste. 3. You can add some nuts like cashews and almonds. Grate them if you like. 4. You can refrigerate it and serve it cold. Hope you liked the Chocolate oats recipe. Try it and leave your comments. You can easily prepare in 5 minutes and you do not need to spend more time in kitchen to serve a healthy after school snacks for your kids. Check out more Kids snacks ideas.